Well, that was fun...while it lasted. 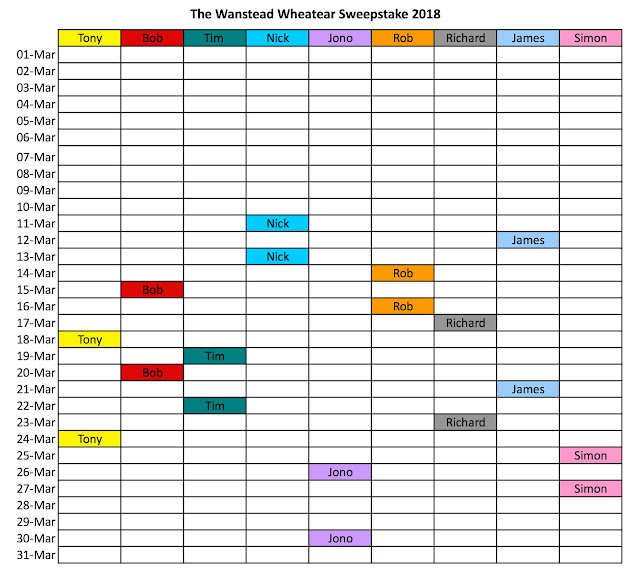 Congratulations to Mr Rob Sheldon who is the 2018 'Wanstead Wheatear Sweepstake' winner by correctly predicting the date of the first Wheatear to put in an appearance on Wanstead Flats. He not only predicted the correct date but only goes and finds the birds himself, picking out 2 possibly 3 males early on the Flats this morning. There was a brief stewards enquiry when we got notified of his find, as Rob had just returned from a trip abroad and we had to clarify he hadn't skipped through customs with a pocket full of Wheatears, but on checking his passport this clearly showed a Bangladesh stamp - not a known strong hold for Northern Wheatear. Plans are a foot for the 'Golden Wheatear' presentation in which the mayor of Woodford and Wanstead will be presenting this years winner with this much sought after trophy at a venue to be decided (probably a local Witherspoons) along with the prize giving of as much booze Rob can consume on behalf of his fellow contestants - who aren't bitter about his win at all! One contestant (I'm not mentioning any names) declared that Wheatears were sh*t anyway after spending every second of daylight looking for them, but drew a blank on the two days they'd chosen - thankfully he is now making a full recovery after sleeping off a K-Cider binge and an increase in his medication. 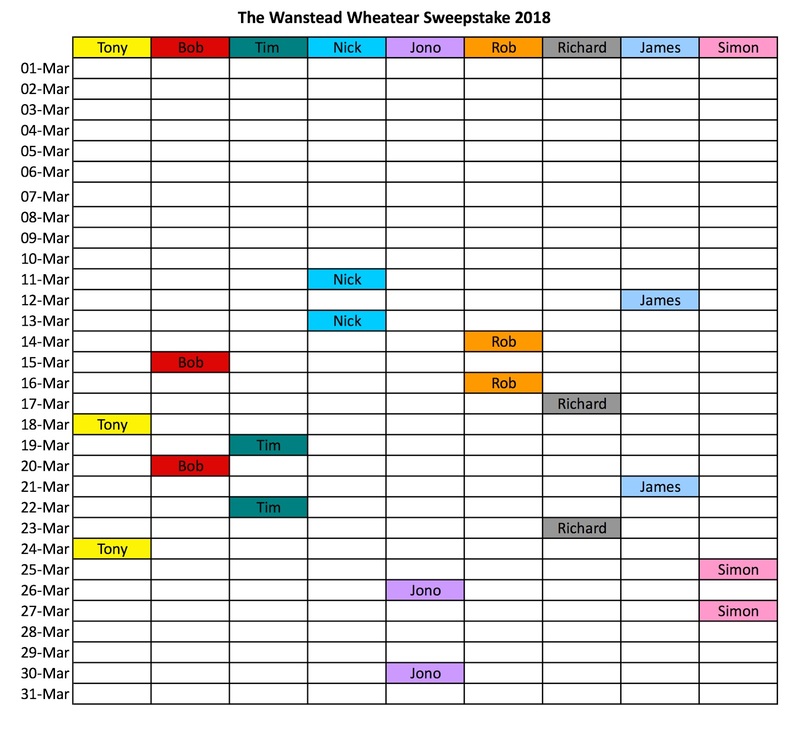 Rob Sheldon correctly selected the 16th March - and is this years winner. Commiserations to the all the other contestants...there's always next year! Makes a change from Hawfinches I suppose... no, joking apart, Wheatears are the business. Yes..Wheatears are the business Steve, but seeing hundreds of Hawfinches give them a close run for their money! Jono’s Wheatear radar does appear to be broken...I blame the jet lag!